Over the last few years, Dr. K.M. Sreekumar has been trying to expose the myth and realities in organic farming. Dr. Rasheed Sulaiman V. recently interviewed Dr. K.M. Sreekumar to know his perspectives on this topic and to get his advice on what position extension workers should take while interacting with farmers on this issue. “Lot of people, including extension workers have currently started to believe that external inputs used in farming are injurious to health and that the only way forward to ensure safe food production is organic farming. This perception can have severe implications on the future of Indian agriculture and therefore, needs to be challenged with facts and figures”. Q: Is organic farming the solution to all our problems in agriculture and health? A: No. Organic farming is neither going to address issues pertaining to food security nor good health. It appears that a lot of misinformation is deliberately being fed to give an impression that the food one eats nowadays is poisonous and we should only consume organically grown food to remain healthy. However, the fact remains that there is no sufficient evidence to prove that one type of farming is better than the other. The bigger question is the ability of organic farming to produce enough food to feed the steadily increasing population. Nobody seems willing to answer these questions. By keeping silent on these issues, agricultural scientists are unintentionally promoting agricultural practices that are not helping the farmers, the consumers or the environment. Q: There is an increasing belief among many that consuming organically grown food (grown without chemical fertilizers and pesticides) is better for health and it provides increased nutrition compared to those grown traditionally with external inputs such as chemical fertilizers and pesticides. Is there any basis for this? A: Organic farmers and certifying agencies often claim of these additional benefits on consuming organic food products. These days, this belief is also spreading widely among the general public. But a meta-analysis based on 98,727 studies shows that this claim is hollow. There is no conclusive evidence to show that organic foods provide better nutrition leading to better health (Box 1). From a total of 98,727 articles, scientists identified 12 relevant studies. A variety of different study designs were used; there were 8 reports (67%) of human studies, including 6 clinical trials, 1 cohort study, and 1 cross-sectional study, and 4 reports (33%) of studies in animals or human cell lines or serum. The results of the largest study suggested an association of reported consumption of strictly organic dairy products with a reduced risk of eczema in infants, but the majority of the remaining studies showed no evidence of differences in nutrition-related health outcomes that result from exposure to organic or conventionally produced foodstuffs. Source: Alan D. Dangour, Karen Lock, Arabella Hayter, Andrea Aikenhead, Elizabeth Allen and Ricardo Uauy: Nutrition Related Health Effects of Organic Foods: A Systemic Review (2010), The American Journal of Clinical Nutrition, 92 (1) pp. 203-210). Q: Can organically grown food protect one from cancer? A: This is yet another widely spread myth, which was examined in detail in a study on 0.6 million women. The study comprised of six lakh women aged 50 years or above for a period of 9 years. Out of 0.6 million women, 450,000 women were consistently taking organic foods. The rest 150,000 were not particular about organic foods and were consuming all types of food. During the study period, 16 types of cancers were detected in 50,000 women which was further examined to reach the conclusion that “In this large perspective study, there was little or no decrease in the incidence of cancer associated with consumption of organic food except possibly for non-Hodgkin lymphoma” (Bradberry, K.E et al Organic Food Consumption and the Incidence of Cancer in a Large Prospective Study of Women in the United Kingdom (2014). British Journal of Cancer, 2014 April 29; 110(9): 2321-6). Q: But generally farmers believe that long-term use of chemical fertilizer leads to loss of soil health and use of organic manure is the only way to preserve and improve soil health. A: There is a common belief that addition of chemical fertilizers adversely affects the health of soil as well as people. But this is not true. Long-term fertilizer experiments (LTFE) were initiated in Rothamstead in England in 1845 and later in different countries (all over the world in different types of soils, crops and climatic conditions) to compare the effect of organic manures and chemical fertilizers on soil health and yields. In India, the All India Co-ordinated Research Project (AICRP) on long-term soil fertility was conducted from 1970 onwards at 30 centres across the country in different types of soils, crops and agro-ecological units. All these unequivocally show that organic manures and chemical fertilizers used in an integrated manner had highest productivity and did not degrade the soil. However, use of chemical fertilizers alone for a long time resulted in higher acidity; buildup of phosphorus, lowered organic carbon, micronutrients and microbial activity. Similarly, use of organic manures alone resulted in unavailability of certain micronutrients due to chelation and higher acidity. Addition of organic manures alone does not provide the necessary nutrients for the crops to overcome the inadequacies inherent in any type of soil. So the best option is to go for integrated nutrient management. We need to clearly communicate to farmers that fertilizers are not poisons when used at the recommended rate or concentration. Both Urea and animal urine have Nitrogen (N). The only difference is that Urea is an industrial product and it has N in higher concentration. Phosphoric and potassic fertilizers are mostly excavated from earth like muriate of potash, sulphate of potash etc. Calcium carbonate is lime. Dolomite which is a calcium and magnesium source is a mineral. Borax is a mineral. Magnesium sulphate is Magnesium carbonate (which is a mineral) treated with Sulphuric acid. Magnesite which is another Magnesium source is a mineral. Environmental pollution related to chemical fertilizers use can be minimized by increasing the fertilizer use efficiency in a number of ways suitable to each locality. Q: There is an increasing awareness on cancer these days and quite often pesticides have been blamed as one of the main reasons for an increasing incidence of cancer. Are pesticides the reason for this? A: Yes, incidence of cancer is on the rise. Quite often this is attributed to the increased use of pesticides. But there is no reason to believe that increased use of pesticides and incidence of cancer are co-related. Tobacco, alcohol and preserved red meat are known carcinogens. In addition, increase in age and incidence of cancer is highly correlated. In other words, with increase in age, the cancer incidence also increases. The website Cancer Research UK states that “We have more cancer, because we live longer”. Study shows that above 75 years of age, cancer incidence increases fivefold. When the age increases, the chromosomal aberrations accrue leading to increased chances of cancer. This is evident from the relationship between longevity of people and cancer incidence in different countries. Developed countries such as USA, UK, France, Germany, Australia, Singapore, etc., with an average longevity of more than 80 years have a cancer incidence rate of above 300 (per one lakh population) whereas India with its longevity of 69 years has a cancer incidence rate of 98 only (See Box 2). Box 2: Pesticides and Cancer? There are 4 groups of materials. Materials which are proven carcinogens in human beings are put under group I. Group IIA contains materials that are possible carcinogens. Group IIB are possible carcinogens. Group III contains materials which are not classified as carcinogens and group IV are non-carcinogens. Now let us examine which are the materials present in each group. There are 118 materials in group I, but out of this there is only one insecticide that is Lindane, which is a banned pesticide in India. But tobacco, alcoholic beverages, many viruses, fungus, plant products and industrial materials, beetle leaves, areca nut, tobacco, Heliobacter pylori, processed meat, chimney soot, wood dust, sunlight, rubber manufacturing industry, vocation as a painter, papiloma virus, hepatitis virus, certain parasites etc., come under this group. When there is constant contact with these items, the chances of developing cancer is high. In the IIA group, banned pesticides like Diazinon, Glyphosate, DDT, and present day pesticides like Malathion are included. The vocation of a barber also comes under this group. In the IIB group, banned pesticides like Aramite, Heptachlor, Mirex, etc., are included. These are banned not solely because they are carcinogenic. When new and better chemicals are available, old ones will be avoided. In group III, banned pesticides like Aldicarb, Aldrin, Atrazine, Dieldrin, Endrin and the present day pesticides like Dicofol, Fenvalerate, Carbaryl, Deltramethrin, Permethrin, Zineb, Ziram, and Colouring materials like Sudan Red, Sunset Yellow, and Caffeine (major alkaloid in coffee and tea ) are included. From the information, it can be discerned that to avoid cancer, one has to be more careful about alcoholic beverages, tobacco, beetle leaves, areca nut, viruses, processed meat, parasites etc., rather than pesticides. The present day pesticide chemicals have undergone stringent toxicological tests on their mutagenicity, carcinogenicity, teratogenicity etc. During 1960s the rate of pesticides applied was 25kg/hectare which has now reduced to just 50gms with the availability of newer molecules. So the pesticide load in the environment is highly reduced. Indeed we are moving on to safer agriculture. Q: But what about pesticide residues? There seems to be an overuse of pesticides and the lab studies pointing out to pesticide residues in food above the limits prescribed. Are these residues hazardous to health? A: The Study conducted by All India Network Project for Pesticide Residues with 26 centers in the country shows the Concentration of pesticides above MRL (Maximum Residue Limit) has been detected only in 2-3 per cent of samples tested in the last five years. This is a vast improvement when compared to 1990s when it was near 10%. The use of pesticides should be scientifically tuned so that the value is brought below 1% level. The farmers need to be educated about safe use of pesticides, Good Agricultural Practices (GAP) etc. This is a challenge for the extension system. It may be noted that even in the 1990s when more than 10% of the vegetables showed residues more than MRLs, none of the food samples from the 469 hotels showed residues higher than MRL values. Apart from these, washing and cooking greatly reduce these residues (Box 3). Maximum residue limits (MRL) are the upper lethal levels of a concentration for pesticide residue in food or feed based on good agricultural practices (GAP). This will ensure the lowest possible consumer exposure. MRL values are fixed based on the residues in crops following GAP for such crops. For any pesticide molecule first NOAEL (No Observable Adverse Effect Level) and LOAEL (Lowest Observable Adverse Effect Level) are fixed based on extensive experiments on test animals (mainly rats) for many generations. Onehundredth (1/100th) of NOAEL for rats is taken as the Acceptable Daily Intake (ADI) for human beings. ADI is the level of chemical which if taken for an entire life period will not cause any adverse effect. MRL, ADI, NOAEL etc. are fixed by World Health Organization (WHO) and Food and Agricultural Organization of the United Nations (FAO). Farm produce are drawn from markets and checked for MRL values to know whether GAP is followed. This value is important in international trade also. MRL values for different farm produce are fixed in such a way that the total consumption of pesticide residues by a person never exceeds 80% of the ADI value. This shows that MRL value is not the lowest residue level that is consumable but one-hundredth below such a level. Q: But recent media reports (March 2017) have mentioned about a UN document that reports about 200,000 deaths due to pesticide poisoning every year. as USEPA. Moreover, data on safety, effectiveness, carcinogenicity, teratogenicity, mutagenicity, effect on non target organisms, environment and various other parameters have to be generated in accredited laboratories in India and submitted to the Central Insecticide Board. 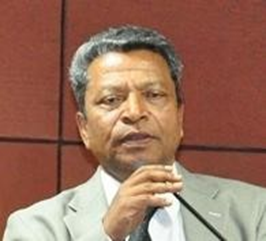 Director General of Health Services is the chairman of the board with members from various disciplines. Only after the examination of the data and other aspects, approval is granted. Moreover, after every five years, there will be review of the decisions on the light of the new scientific evidences generated during the period. Q: Is organic food tastier compared to traditional food? A: This is another popular myth. A farm produce will have good taste if the plant receives the required elements in the correct quantity and proportion during different phases of its life. For instance, if potassium is not available in sufficient quantity, banana fruits will develop hard tissues like stone inside the fruit and will be less sweet. If boron is insufficient, cauliflowers will rot. Deficiency of calcium will lead to flower end rot in tomato. Since our soils are deficient in some or the other nutrients, organic manures alone might not be able to provide all the nutrients in required proportion, leading to some problems in the produce. In another meta-analysis, examining the safety and quality of organic vis- a-vis traditional farm produce, it was observed that there is no proof to support such a claim. More details can be found in the paper by Crystal Smith-Spangler et al 2012, Are Organic Foods Safer or Healthier than Conventional Alternatives? : A Systematic Review; Annals of Internal Medicine, 4 September 2012, Vol. 157, No. 5: 348-366). Q: Is productivity low in Organic Farming? A: It is a well-known fact that productivity is low in organic farming, but the extent of yield reduction would vary based on a number of reasons. In a meta-analysis study of 316 studies comprising 34 different crops, it has been observed that the yield reduction may range from 4% to 34% with an average of 25% in organic farming. The reduction in productivity in case of fruit crops was 3%, oil seeds was 11%, grains was 26% and vegetables 33%. In case of perennial crops, the reduction in productivity is low (Verena Seufert, Navin Ramankutty & Jonathan A. Foley (2012) Comparing the Yields of Organic and Conventional Agriculture. Nature,,485, 229–232. 25 April 2012). Q: But will this low productivity be compensated by lower cost of cultivation and high price realization by farmers? A: Lower cost of cultivation in organic farming is a fad that is not supported by facts. If major and secondary nutrients are to be provided by organic means alone, it will be costlier than traditional farming. For example, Magnesium (Mg) is an essential secondary nutrient which is scarce in cultivated soils. If I were to add 25 kg Magnesium Sulphate (MgSo4) in 1 Ha of paddy, it will cost Rs. 1500 which will provide 5 kg of Mg. Whereas, if this much quantity of Mg is to be added in the organic farming 2500 kg of organic matter has to be applied, costing Rs. 12,500. This is true for other nutrients also. Organic matter is expensive. Since it is bulkier, transportation cost will also be higher. In the field of pest management, it is proven that for effective pest management in organic /biological way, more number of applications have to be given, thereby increasing costs. Q: But the premium price received for organic produce might compensate for low productivity? A: Let us examine premium price theory for organic produce. Agencies which consistently support farmers (throughout the value chain) till the marketing stage may be able to fetch premium price for the organic produce. But such agencies are few. Most of the agencies monitor farm activities over a period of 3 years, issue a certificate and exit. Mostly, they don’t bother about marketing the produce coming from the certified farmers. When the supply of organic products is gradually increasing in the market, it is very uncertain how long the produce will continue to fetch premium price. Moreover, if the consumers realize that the organic products do not have the merits/advantages/value it claims, this niche market may reduce further. Q: Are chemicals used in organic farming? If so, what are the chemicals permitted for use in organic farming by different agencies? A: The common belief among most people, including extension workers is that chemicals are not at all permitted in organic farming or at least in certified organic farming. It is not true. Contrary to popular perception/belief, many agencies/governments permit use of certain chemicals in organic farming. For example, USDA organic has permitted use of alcohol (ethanol & isopropanol), chlorine mixture (Hypochlorite, Sodium hypochlorite), Copper Sulphate, soap-based herbicides, Para-acetic acid, Ammonium carbonate, Boric acid, Sodium carbonate per hydrate, elemental sulphur, MgSo4, Vitamin D3, Vitamin B, C, E, Lignin sulphonate, and pheromonal chemicals for pest management. National programme for organic farming in India also permits many such chemicals. The interesting fact is that the copper products which are permitted in organic farming are more toxic than many of the pesticides which are not permitted in organic farming. Q: But without any obvious benefits for agriculture and health, there is still an increasing craze for organic foods globally. According to a recently published TechSci Research report, “Global Organic Food Market Forecast & Opportunities, 2020“, global organic food market is projected to register a CAGR of over 16% during 2015 – 2020. How do you explain this? A: Increasing income levels, improved standard of living and growing health concerns among urban consumers are fuelling this trend. News about ill effects of farm produce grown with chemical fertilizers and pesticides are often exacerbated by the media. Apart from these, the policy of some states which are often proclaimed without scientific examination and sufficient studies are also contributing to the craze for organic foods. You might have read the recent report “the world of organic agriculture 2017” which has presented a promising picture about organic farming? A: The report has given a rosy picture about the state of organic farming in the world. But, if you read between the lines, you can clearly glean a few facts hidden behind the tall claims presented in the report. First of all, the share of land under organic farming is abysmally low (1.1% of total agricultural land). Again, one third of this agricultural land is grass-land only (33.1 Million Ha). Available arable land is 20% only (10 million Ha.) Out of this, land under cereals is only 3.9 MHa. 2.5 Mha is under fodder crops. Cultivation of cereals- the staple food of billions of people in the world is still under conventional farming. Because of this, the world has food security. Another interesting aspect is that 45% of the worlds’ organic agricultural land is in Australia (Oceania) and 99% of it is under grazing land. If only the certified organic is taken into account, the figures will be still low. Misinformed farmers cultivate organically and misinformed consumers consume organic products. Q: The Indian Government is investing heavily to promote organic farming through the National Centre for Organic Farming (NCOF) and through the Paramparagat Krishi Vikas Yojana. How do you see these developments? A: It is obvious that we only become quality conscious when our stomach is full. Lack of conviction among the agricultural research managers in their own technologies and lack of their confidence in communication with the policy makers has led to these types of investments. This is a worldwide phenomenon and India is not an exception. The business interests of the certifying agencies also play a role in this. These agencies spread information on the exaggerated health benefits of organic foods. People and administrators accept this without questioning. If the statistics are closely examined it is obvious that the share of organic production of cereals, vegetables and fruits is very low compared to those grown conventionally. Organic farming as a hobby is OK, but organic farming as a state policy is dangerous as it negates science and compromises food security. 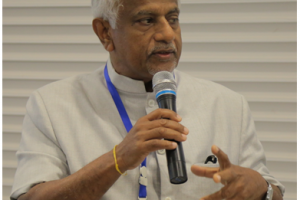 NCOF and its regional centers must focus on development of technologies which are bio-rational and identify technologies that are unsustainable. They should not fall into the trap of some of the preachers from the developed nations who are spreading anti-science notions. Q: It seems there is a lot of confusion on the use of terms such as traditional agriculture, sustainable agriculture and organic agriculture? Do you think lack of clarity on use of these different terms could compromise on the food security of India in the long run? A: In fact, the concepts of traditional agriculture, organic agriculture and sustainable agriculture are different. Sustainability is defined as the ability to meet present day needs without compromising the needs of the future generations. We have to ensure food security, safe food and nutritional security and farm income without deteriorating the natural resources like soil, water and biological resources. Scientifically fine-tuned agriculture will be better in terms of agricultural sustainability because it is not limited by the dogmatic feeling that chemicals are bad and should not be used. As the basic premise of modern scientific agriculture is science, it has the potential to address its shortcomings through science and there is scope for continuous improvement. Q: Can you cite an example? A: Micronutrient deficiencies are rampant in agricultural fields all over the world. Micronutrients are essential but at slightly higher concentration, they become toxic. The best option is to apply it as foliar spray in correct concentration during the correct stage of the crop. But in organic farming, foliar nutrition is prohibited. Providing minerals through organic means is costly and difficult. Organic manure produced from the farm will be deficient in micronutrients. So supplementing micronutrients from external sources is essential here. Like this, there are many unfounded stipulations in organic farming such as resistance to use of GMOs, herbicides, water-soluble fertilizers, chemical pesticides, hormones, etc. It can be seen that utilization of these technologies may be environmentally far more sustainable than technologies used in organic farming. So, the argument that organic farming is more sustainable doesn’t stand to scrutiny. Organic farming is negation of science. By negating science, we cannot progress. Q: Clearly the extension advisors in India are unable to provide clear answers to farmers who seek questions on the nature of inputs, their use and impact on agriculture and health. And a lot of contradictory advice is given to farmers by different agencies on these aspects. According to you, what type of advice should extension officials provide farmers? A: Extension advisors need to be rational, critical and logical in their approach to farm advisory provision. Never negate science and always ask for evidences. While giving advices to farmers, there should be clarity and no contradictions. We shouldn’t mix organic farming and scientific farming. 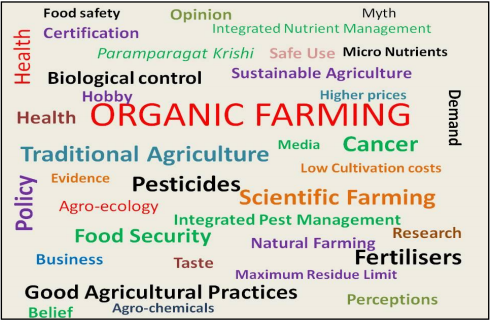 Those who want to adopt organic farming methods may do so in special sectors such as cultivation of spices and medicinal plants, cultivation of tap rooted perennial crops, vegetable and fruit cultivation for high income markets, farm and home tourism sectors, etc. Those who are pursuing agriculture as a hobby may also experiment with organic farming methods. Those who have time and labour to cater to small plots of vegetable or those grown on terraces in pots can adopt hand picking of insects that damage their crops and thereby reduce chemical pesticide use. Experimentation by farmers and NGOs is always welcome, but the process and outcomes of experimentation should be subject to scientific scrutiny. However, others who make a living out of agriculture and see it as an enterprise, extension personnel should advise to go for GAP (Good Agricultural Practices) based farming, Integrated Nutrient Management and Integrated Pest Management (IPM) with more emphasis on biological methods of control, soil test based nutrient application, increasing nutrient use efficiency, adoption of precision farming technologies and use of pest and disease resistant varieties, etc. Extension advisors should also enhance the ability of farmers to understand the nature of different chemicals (pesticides, fertilizers) used in farming and also on the safe use and disposal of pesticides. They should also educate farmers on the problems with excessive use of agrochemicals and to adopt responsible and safe use (and disposal) of pesticides. Q: Some argue that the role of extension is not to advise, but facilitate farmers to experiment, learn and come to their own conclusions. According to them, new knowledge will be adopted through farmer to farmer extension and farmers observing farm practices of other farmers. Do you think this is true? A: Of course, farmers do learn from each other, like everyone else. We should promote such lateral learning. In India, the NSSO (National Sampling Survey Organisation) surveys have shown that other farmers continue to remain as the most important source of advice for farmers. But this is mainly due to the lacunae in extension delivery. But I have also seen several farmers approach Agricultural Scientists and Agricultural Officers every day to seek advice on different aspects related to agricultural production. Most farmers do need professional advice and they seek advice. They realize the limitations of their own knowledge and are regularly looking for advice to supplement/improve their farming practices and enhance their income. We need to assist them quickly instead of asking them to go and learn from other farmers. In many countries, farmers’ organizations hire advisors/consultants to advise their members on farming. Farmers are not different from us. For instance, I believe all of us go to a Doctor/Physician when we face health problems and get their advice/prescriptions to solve the problem. We may discuss our issues with our neighbours and friends, but finally consult a doctor and take his prescription on what to do. Q: Any other final advice to extension advisors? A: Firstly, never negate science. Always ask for evidences such as studies published in well-rated journals. Secondly, always use systems approach for solving problems rather than single bullet remedies. Thirdly, never get moved by media reports alone. Always examine the other side of the story before making a judgment. Always think critically. Finally, stand for farmers and stand for science consistently. Congrats for an excellent F2F I really enjoyed reading. I really wish that our scientists should emulate Dr K. M Sreekumar in expressing ideas and information with faith and courage. I have the following observations – Our scientists should not be too emotional in communication rather they should be rational and backed by documented evidences – In scientific communication, two sides of the message (positive as well as negative) should be given. Usually, what is seen is that only positive things are projected. Negative things, if any, should also be provided. Let the readers judge the merit – Misinformation, favoured information, partial information, wrong information, skewed information should be avoided. – Dilution of scientific facts and manufacturing of information should be avoided ( This is very much seen in literature on Organic Farming) – My experience while working in Kerala Horticultural Development Progrmme (KHDP) is that Participatory Technology Development (PTD) experiments can provide valuable information regarding field situations, which is very much relevant in the context of organic vs chemical agriculture. There is also a serious problem of nomenclatures – every other day a new name is being coined by anybody and everybody, which is creating more confusion than helping the farmers. For instance, the Organic farming has company in Natural farming, Non-violent farming!, LEISA farming, traditional farming, conventional farming, green revolution farming, Zero tillage farming Zero budget farming and so on and on… imagine the plight of farmers …. Very interesting, timely document to inform/educate the public in general and extension workers in particular about the truths and myths about the current crazy fad on organic farming. The beliefs have to be tested and supported with scientific facts and the scientific evidences available as of now will not endorse the commonly held views on the topic in different forms/ways as so nicely posed to Sreekumar by Rasheed and answered equally brilliantly by him. Good contribution/message by both of them to dispel misplaced confusions/vested interests and act rationally with clarity and responsibility. Congratulations!. Thanks for this much needed timely contribution in an area which is buzz word in last few years and getting further momentum. In fact, there is kind of euphoria about organic foods wolrdwide and even more in India. The total volume of Indias export of organic agricultural products during 2015-16 was 263687 MT. The organic food export realization was around 298 million USD.India produced around 1.35 million MT (2015-16) of certified organic products which includes all varieties of food products namely Sugarcane, Oil Seeds, Cereals & Millets, Cotton, Pulses, Medicinal Plants, Tea, Fruits, Spices, Dry Fruits, Vegetables, Coffee etc. . The production is not limited to the edible sector but also produces organic cotton fiber, functional food products etc. While I will be commenting on this in next few days, in the meantime thought of sharing an article published in Nature. This says, “initial evidence indicates that organic agricultural systems deliver greater ecosystem services and social benefits. Although organic agriculture has an untapped role to play when it comes to the establishment of sustainable farming systems, no single approach will safely feed the planet. Rather, a blend of organic and other innovative farming systems is needed. Significant barriers exist to adopting these systems, however, and a diversity of policy instruments will be required to facilitate their development and implementation. The subject definitely requires a detailed debate.